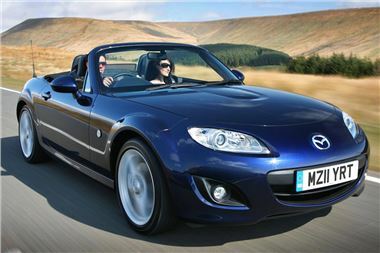 The world’s best-selling roadster, the Mazda MX-5 has been ranked the highest sports car in the 2011 J.D. Power vehicle ownership satisfaction survey, published last week. With almost 17,000 motorists from across the UK taking part in the highly-respected annual survey, owners of Mazda’s iconic two-seater rated their cars well above the competition for its driving dynamics, handling, low ownership costs, mechanical reliability and interior quality. Remarkably, the Mazda MX-5 notched up a satisfaction rating of 82.4 percent, an increase on its score from last year and an even greater margin of victory over its rivals than in 2010. The MX-5 beat the Volkswagen Scirocco, Audi TT, and Mercedes-Benz CLK and SLK. Earlier this year, the regular 10-strong range of Mazda MX-5 models was boosted by the arrival of two special editions of the legendary roadster, called the MX-5 Kendo. MX-5s are priced from £17,990 to £23,225. Kendo special editioons from £18,270. The Kendo celebrates global MX-5 sales passing 900,000 units, including more than 100,000 in the UK. “Today, the Mazda MX-5 remains unrivalled as a rewarding sportscar that can also be used for everyday motoring all year round,” said Peter Allibon, Sales Director, Mazda Motors UK. “The MX-5 soft-top continues to offer the purest, fun-to-drive thrills, while the Roadster Coupe’s folding hard top provides a more refined experience, with that same exhilarating drive. Its low running costs and legendary reliability means the MX-5 remains an extremely competitive proposition as hundreds of very satisfied owners confirm.